On Feburary 15, 2018, the Louisiana Department of Revenue (LDR) announced updated tax tables and formulas that were effective February 16, 2018. The changes were made to make adjustments in light of changes in federal income tax laws that will impact 2018 income tax returns. Louisiana's withholding methodology is unique and, like a number of states that have state income tax withholding (most do), it requires special programming logic. In reviewing our existing Louisiana state income tax logic, we realized that it needed to be completely changed to not only correctly accommodate the recent changes but also to more accurately compute the required withholding. Unlike withholding at the federal level and most other states (although there are exceptions), Louisiana separates dependency "credits" from "personal exemptions." In most states, there is a single number for state allowances ("or exemptions") and often the number claimed by employees is the same as the federal amount. 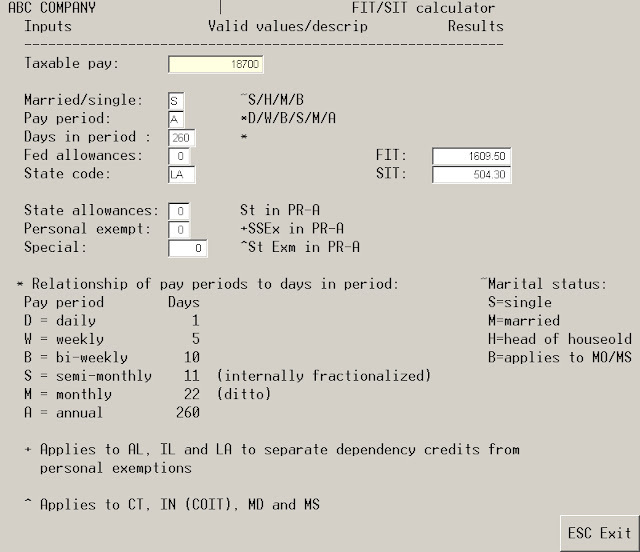 Those allowances are usually indicated under "St" in the Advanced Accounting PR-A employee maintenance screen. For Lousiana however the "St" value will now be used only for dependency credits. This is the number contained on Block B of Louisiana form R-4. This is the number of dependents (as defined by IRS code) the employee will be claiming on their Louisiana tax return other than the employee or a spouse. Personal exemptions should be entered under SSEx with these possible values: 0-none 1-employee 2-employee and spouse (i.e. the Block A value on form R-4). A value of 2 can only be entered as a personal exemption if the employee's marital status is "M" (married); a single employee can only claim 0 or 1. A married employee can also claim 0 or 1, but one of the unusual aspects of the LDR logic is that in that event, the state income tax logic reverts to being the same as if a single employee. The 0 or 1 personal exemption election falls then into a different logic flow than a claim of 2 personal exemptions. 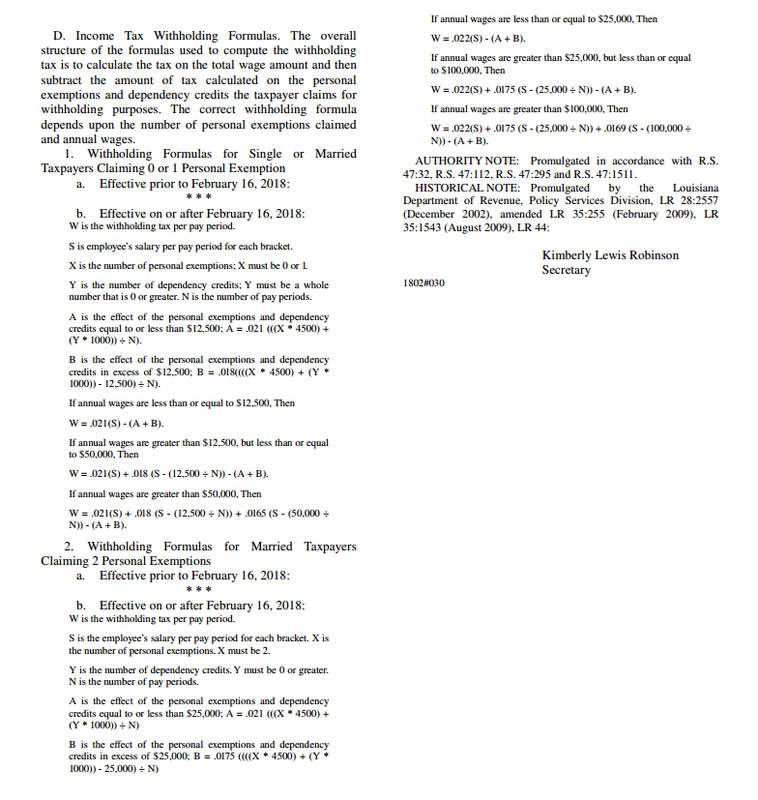 If the employee claims no personal exemptions but does claim dependency credits, the LDR's tax tables do not provide guidance as to the amount to withhold, but Advanced Accounting will nonetheless calculate the tax based on the formula logic. Each additional state withholding allowance reduces, on an annualized basis, the tax withheld by $21. The selection of a personal exemption of 1 or 2 however then starts the calculation at a lower level, with some different rates and tax bracket logic applying to different wage bracket tiers. 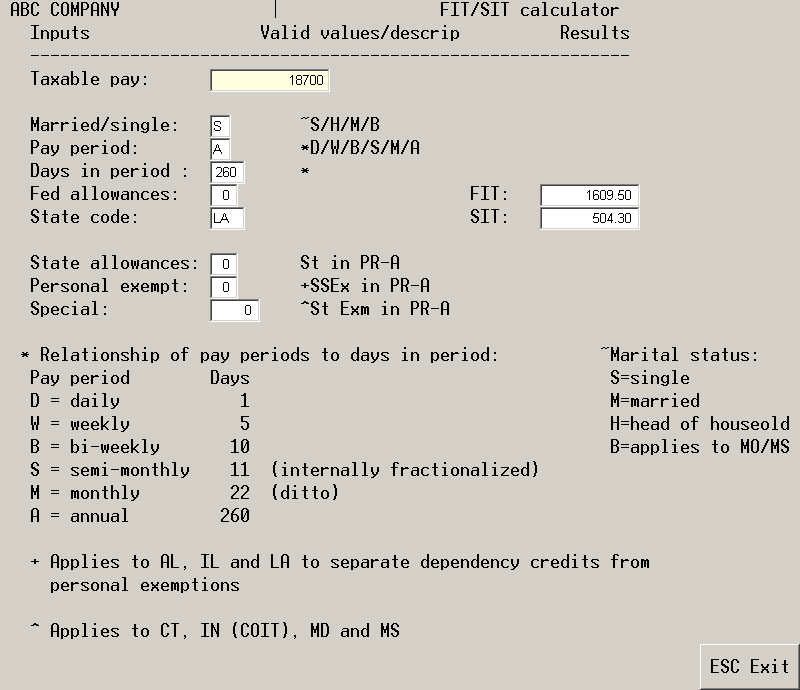 In order to verify that the rewritten logic implemented in Advanced Accounting's PR-B was accurate, we had to modify the FIT/SIT calculator recently introduced in the software to take into account the separation of the dependency credits from the personal exemptions as outlined below. In order to compare the withholding formula results to the tax tables provided by LDR, use the wages in any given bracket that is the average of the min. and max. values. So for the bracket 18,501 to 18,900, in the calculator use 18,700. For an employee claiming no personal exemptions (regardless then of marital status) and no dependency credits (i.e. state allowances on the screen above), the Louisiana state income tax is $504.30 (annualized) which exactly matches the table amount for that bracket. Changing the personal exemption to 1 reduces the calculation to $409.80. Adding one state allowance (dependency credit) results in a value $21 less or $388.80. Changing the marital status to M and claiming 2 personal exemptions and no state allowances results in a calculation of $222.40. Adding a dependency credit reduces that amount by $21 to $201.40. We have further tested the updated program using salaries in all ranges that the LDR tax logic impacts, and with both 0, 1 and 2 personal exemptions in those ranges to verify accuracy. 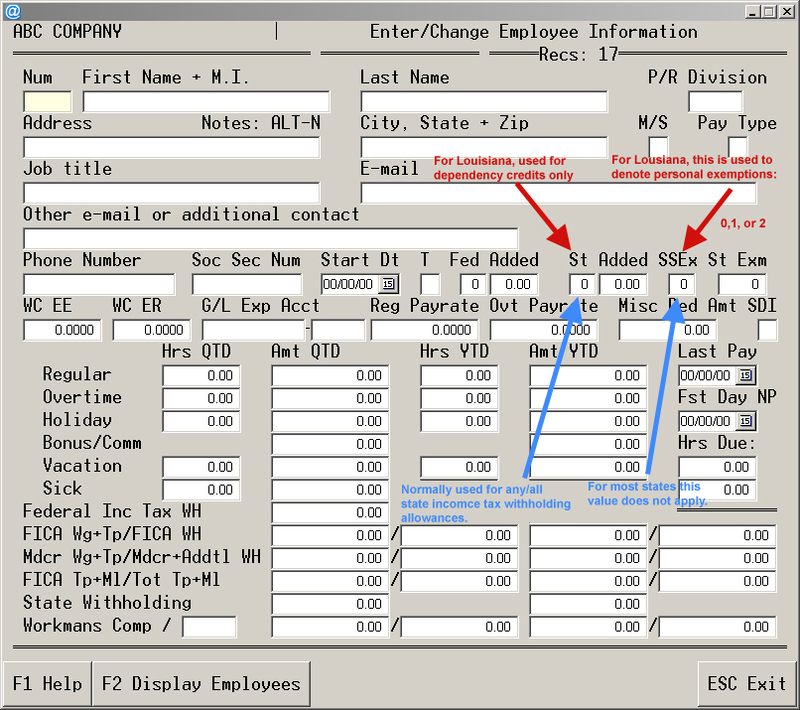 A software update for Louisiana users is now available which includes an update to both Advanced Accounting's PR-A and PR-B program options. 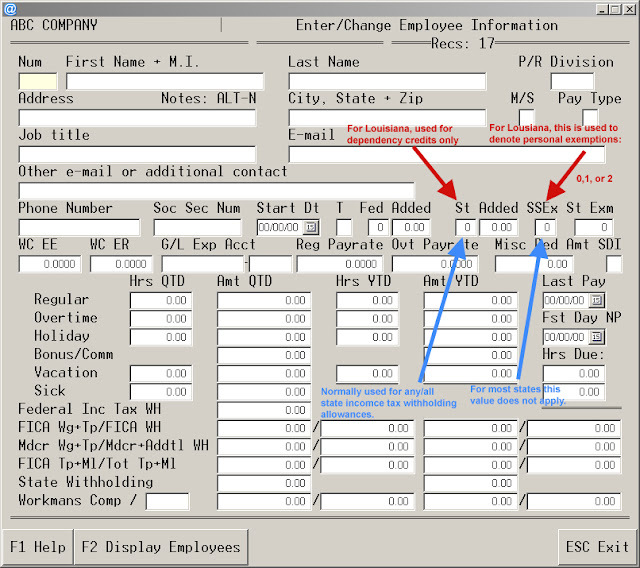 Existing users will, after installing the new update, need to check each employee to ensure that the "St" value now only contains values representing Block B elections and the Block A election amounts are moved to the SSEx field for employees who belong to a division with a state code of LA. In states like Louisiana where different types of allowances or exemptions may apply, this means that both the state L-4 and the federal W-4 will need to be completed by employees. And since the recent federal tax law changes have eliminated personal exemptions, confusion and questions will likely follow.